GAYLORD, Mich. — Alas! A golf course does exist in Gaylord that isn't catering to the "resort golfer." You know, that poor sap who can't play a course unless fairways are 70 yards wide and at least half the tees are so elevated you could stroke a putter off the tee 240. The fairway on the 18th at Black Forest Golf Course is about as forgiving as you'll find here. 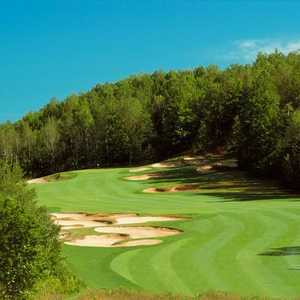 The Black Forest Course at Wilderness Valley boasts one of the most challenging layouts in northern Michigan. It is one of two championship golf courses at the Wilderness Valley Resort. Black Forest is the more challenging of the two, featuring greens that will test even the most seasoned golfers. Sure, anyone can enjoy knocking a drive with reckless abandon down to a fairway 150 feet below, knowing no matter what, that drive will be in play. But you have to feel a little guilty, right? Thankfully there's Black Forest Golf Course, Wilderness Valley's newer big, bad brother opened in 1992 and the subject of rave reviews nationally. With dark, tree-lined holes and small, difficult green complexes, designer Tom Doak isn't out to do you any favors. Black Forest is intimidating, getting its name from the dark evergreens and hardwood forest that shade the course. Paths between holes weave through tight, natural corridors and few parallel holes all add up to an intimidating experience. "There's just one me, and there's a whole lot of trees ..."
Then again, maybe Black Forest just seems ridiculously tight after playing the area's more duffer-friendly courses like Treetops and Black Bear. "The fairways are actually wider than they appear," said Corey Crowell, head professional and general manager at Black Forest. "But if you miss the fairway, you're in the woods." Doak, who currently resides in nearby Traverse City, is one of field's biggest thinkers — and is authoring books about golf and design as much as he's actually doing it. His layouts have layers, like the stories of a Mark Twain satire. When playing Black Forest, do yourself justice to the design principles employed - and yourself - and really take a look at the hole before playing it. "It has angles you can play," Crowell said "You don't have to hit it super long. The green complexes are the main thing. You have to learn where to put it." You could hit driver on almost every hole at Black Forest, but it wouldn't be beneficial. Doak often sets up one landing zone but tempts you with another. Length isn't as much a factor on Black Forest as are the angles. Despite playing 7,044 yards from the black tees and 6,688 yards from the middle-backs, Black Forest is a par 73, with three par 5s on the back side. The 10th is a dauntingly tight par 5 that features a pair of "goal post" trees about 150 yards out. For the second shot, golfers must be wary of their distance and try and lay up short or go past them. As modern-day course greens get bigger and more multi-tiered, Black Forest's greens are surprisingly small - and mind-boggling. You might not make a putt until the back side. "I think he did a good job of fitting the greens to the size of the hole. He didn't move a lot of land for them either. He put a lot of them on natural rises." One of hose natural rises is the 17th, perhaps the course's most difficult approach, playing to a small, tucked, elevated green. The hole is longer than 400 yards as well, so you won't be dropping a soft wedge in either — it'll likely be a mid to long iron. Perhaps the easiest hole on the course is the 18th, playing just 500 yards from the black tees, and is a rare elevated tee to a larger-than-normal landing zone. Black Forest and Wilderness Valley know what they are, and they aren't trying to be a resort. Their facilities are modest, although recently renovated. The clubhouse was remodeled and a deck was added, as well as a fire pit. 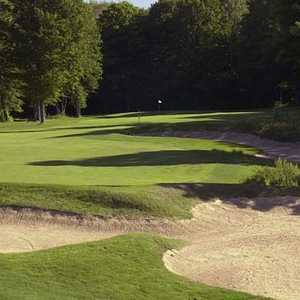 Black Forest is the perfect golf course to play if you think your game isn't getting challenged enough on northern Michigan's more player-friendly resort courses. It's Gaylord's biggest challenge and compared to the Treetops courses, as well as nearby Forest Dunes and Garland Resort that charge more than$100, is a bargain at just $65 (rates are same weekdays and weekends). The classic Otsego Club is located right in downtown Gaylord and is a good hub if you plan on playing a lot in the Gaylord area. There are a variety of lodging options, from simple hotel rooms to condos and cottages overlooking the Classic course. 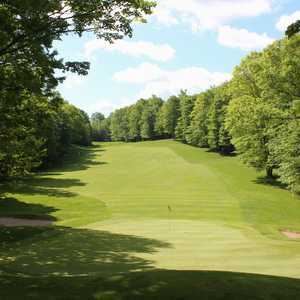 The Treetops Resort is located about five minutes from downtown and most of the lodging is within a short walk of lighted chipping and putting greens. The clubhouse at Black Forest has little more than a grill, featuring decent sandwiches and burgers. The Otsego Club's Pontresina has been known as one of Gaylord's finest dining options since the club opened years back. Overlooking the Sturgeon River valley, the upscale menu features international cuisine. During design, Doak suggested that the cart paths not be paved, to add a more natural feel to the course. Of course, 14 years later after opening, the paths are getting a little rocky, and renovating the paths is an ongoing priority for the maintenance staff.